“What is it with these Alberta mayors, being so cool?” Cowboy Smithx wanted to know. Innovation and reconciliation were prevalent in the comments made by Smith, and guest speakers, as he hosted the opening ceremony for the Indigenous Innovation Summit, which wraps up today in Edmonton. Smith, a filmmaker and member of the Kainai Nation, recognized municipal politicians for the work they were undertaking toward reconciliation. Calgary council is in the process of adding two more flagpoles to city hall, one of which could fly the Treaty 7 flag. A council committee approved a motion in October to fly the flag beside flags from the city, Alberta, Canada and the Union Jack. Now council has to give approval. In March, city council agreed to Blackfoot street names in the new community of Medicine Hill. Smith pointed out that Wetaskiwin’s welcome sign includes Cree syllabics and he acknowledged the reconciliation work being undertaken by that city’s mayor, Bill Elliot. Elliot, speaking at the Truth and Reconciliation Summit held at the Banff Centre for Arts and Creativity at the end of October, said his council honoured the traditions of the Maskwacis nations, participating in sweats and attending pow wows and the inauguration of new band council members. He pointed out that all Wetaskiwin schools had Aboriginal liaison workers and there was a Maskwacis representative on the school board. He noted the Wetaskiwin hospital opened an Aboriginal cultural room a year ago. “It’s little things, it’s not big things. We’re not going to change this really fast,” said Elliot. In 2013, Wetaskiwin passed a proclamation declaring a Year of Reconciliation. Fort Saskatchewan and St. Albert passed similar proclamations after Elliot brought Wetaskiwin’s actions to the attention of the 22 mayors, who comprise the province’s mid-sized cities. 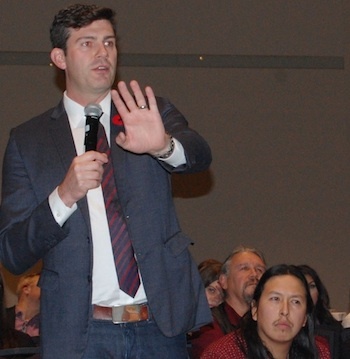 In 2014, Elliot and Edmonton Mayor Don Iveson were named honourary witnesses by the Truth and Reconciliation Commission, when the TRC hosted its final national event in Edmonton. That year, both Edmonton and Calgary proclaimed years of reconciliation for their cities. Edmonton has gone further with implementing work force initiatives, training city employees on historical trauma, said Iveson, who spoke at the innovation summit. Iveson challenged Winnipeg’s claim to having the largest urban Aboriginal population, saying if the metropolitan area were taken into consideration, Edmonton came out ahead. “But think about this: cities are competing for the honour to be associated with Indigenous Canadians. It wasn’t always that way,” he said. “It’s pretty cool to see our leaders in the major cities and in the smaller towns in the rural areas stepping up with these types of gestures of reconciliation. It’s quite a cool thing,” said Smith.